Top 10 Terrible Tattoos In Football | The Transfer Tavern | Where football transfer rumours fly or die! 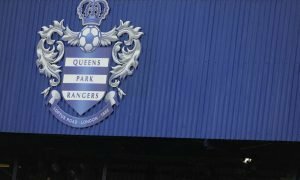 Having tattoos is a fashion that many football players have adopted, with likes of Tim Cahill and Lukas Podolski having a teams crest tattooed. 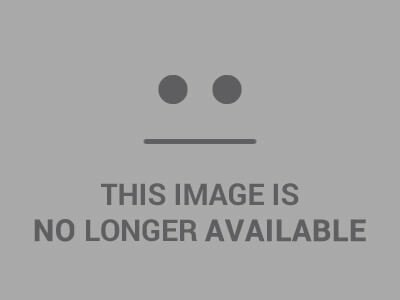 But with news that Podolski is planning to get an Arsenal tattoo done on his left arm, to go with his Cologne tattoo on his right, lets look back at some of the terrible tattoos in football. At number 10 is Toronto FC’s Torsten Frings, formerly of Bayern Munich. Frings sports not so fashionable tribal tattoos on both arms, reminiscent of the days when tattoos were an uncommon in society. 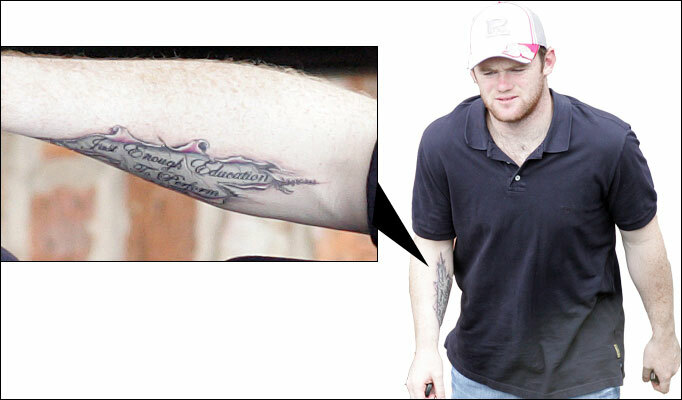 Man Uniteds Rooney somehow thought it was a good idea to get a tattoo of skin ripping away, revealing words from his favourite band Stereophonics, lyrics that remind Rooney how he left education without any GCSE’s. Having recently signed for Spurs, Tottenham fans can look forward to seeing Dempsey’s tattoo of a Roman, Jesus, Angel person on his left shoulder. A tattoo which also has someone lying on floor. I wonder what the meaning is? Vieri had no idea what the Chinese symbols he now has tattooed on his right arm meant. Luckily enough they mean strength, thunder and intelligence, a quality I think Vieri was lacking when also decided to have a quite unmissable arrow tattooed above. Cisse is a man with many tattoos and a player you seems to love using his body as a canvas, a canvas which has leopard prints on it. Not just a few though, alot, apparently a new spot every time he scores, considering he has scored over 200 goals in his career. 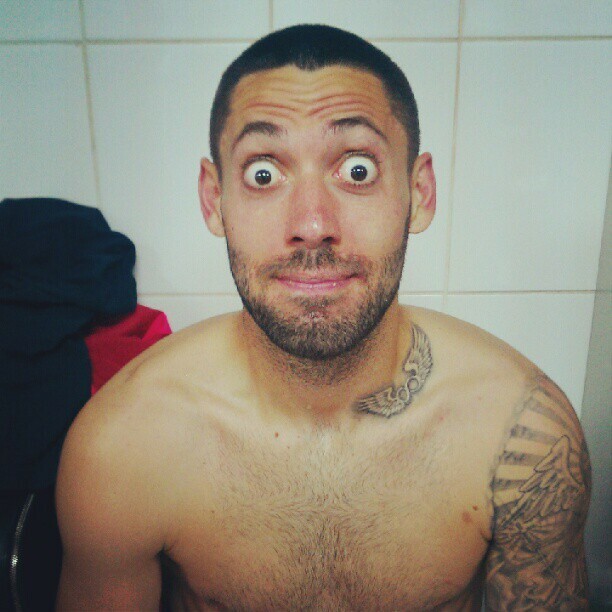 Materazzi is another player with numerous tattoos, some good and bad. Most notably the diamonds tattooed on his left arm, diamonds that you could relate to a computer game. Chelsea’s star man clearly has a thing for Lord of the Rings as he decided to have his first name inked on his left forearm in Elvish. The language of the elves. As in hobbits and trolls, as in fictional characters. 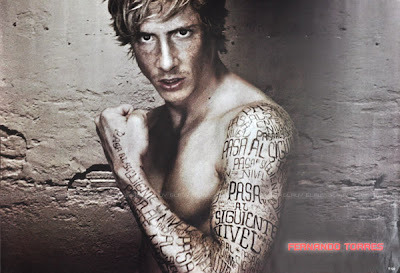 I am not sure what the translation for ridiculous in Elvish is, but I hope some one will tell Torres. To the top 3, and we start off with Zlatan Ibrahimovic. Yet another man with numerous tattoos, again some good and some bad. But the one that stands out are the out of place playing cards on his side. Supposedly for luck, I’ll let you decide whether it has worked or not. 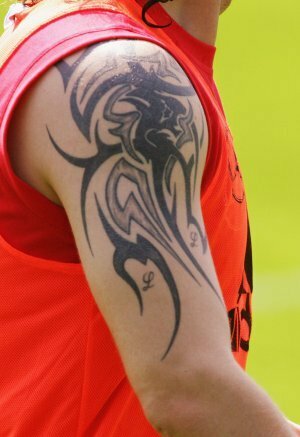 The Villa midfielder has one major tattoo, on his back. Now, it is not the most conventional tattoo and all that needs to be said about it is that, well… Stephen Ireland has a pair of angel wings tattooed on his whole back. 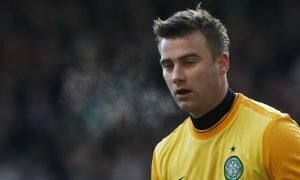 In first place is former Celtic shot stopper Artur Boruc. 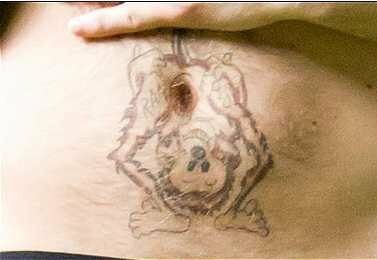 Boruc has a monkey tattooed on his belly, the monkey being upside down by the looks of it. To myself, one of the most ridiculous tattoos I have seen and one that makes me laugh at Boruc and his monkey.